Today, Ruby Jean took me up. Higher than we had ever climbed before. The California Pass reaches 12,960 feet. And there just isn’t much up there. Just silence. And beauty. In all directions. Oh, and an old, abandoned mining town called Animas Forks. Now, that’s my kinda town! Corkscrew Gulch was built in 1882-1883 — during the race to get wagon roads from Silverton and Ouray up to the silver mines that had been discovered on the Red Mountain Divide. For me and Ruby Jean, it’s a glorious journey to the top of the world — just in time for the fall color to arrive. Nestled high in the San Juan Mountains, Ouray was established in the mid-late 19th century by miners in search of sliver and gold. The town sits at about 7,800 feet, but the surrounding mountains frequently exceed 12,000 feet in elevation. Due to its unique history, the entire length of Main Street is registered as a National Historic District. 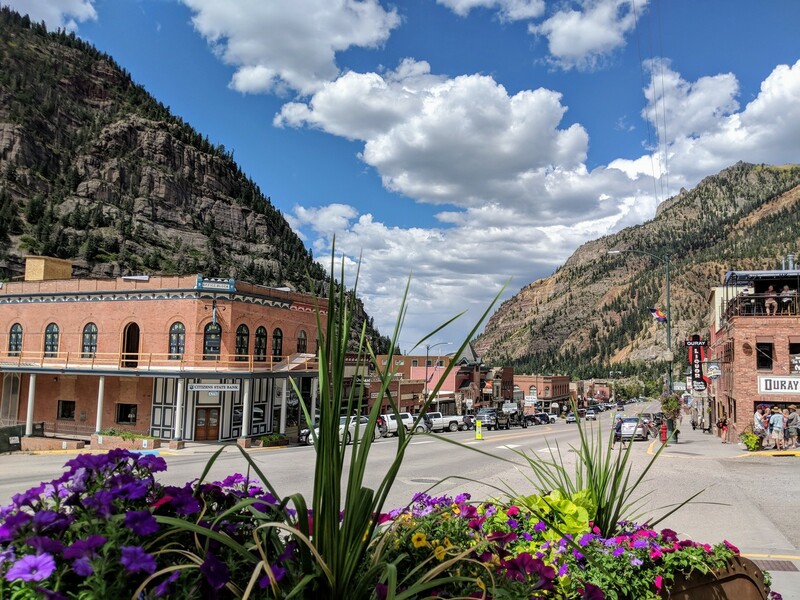 Here’s a great video summarizing why Ouray is a desirable destination in 2018. Time to leave Houston (and that horrible heat + humidity combination) and head home via Colorado. But along the way, it’s comforting to stop and see some old friends. Time for a little local back-country camping with my best buddy. Driving around Washington D.C. offers an endless parade of nondescript office park buildings — like the one pictured above. Imagine our surprise when Google navigated us to a popular breakfast location in the parking lot of one of these buildings. “Google knows best,” we thought, and entered using the only door we could find. With no receptionist desk in sight, we hunted around and stumbled upon some slightly obscure signage. But the faint smell of grilling breakfast burritos urged us on. Eventually we stumbled into an outdoor courtyard. Could this be where the fabled patrons sit and eat their eggs? With the first completely electronic film score in Hollywood history, Dr. Mobius and the Krell technology had more going on than a trans-humanist future. Maybe we all could benefit from a lesson or two?